From golf clubs to shot guns, from baseball gear to blue prints, from fly rods to lacrosse sticks, and from tents to teepees. The Travel Tube carries all that stuff and all the stuff that goes with that stuff! Shoes, balls, tackle, ammo, arrows, tent polls, tarps- you name it. Multiple attachment points. Readily attaches to motorcycles, ATV's, SUV's, cars, trucks, and boats with no additional mounting hardware required. Multiple accessories available: bungee club divider, back pack style shoulder strap, dual leg stand, detachable nylon wheel cart, 24x6 inch nylon zipper pocket bag, 6x6 inch nylon zipper pocket bag, 6x6 nylon mesh cinch bag, pad locks, TSA approved locks, bungee kit and more to come. Made of rugged polyethylene plastic with o-ring seals, water tight and tough as wang leather. Available in multiple colors. Easily disassembled for thorough cleaning and storage. Lightweight and perfectly balanced for easy carrying. Caps make handy beer coolers. Lockable with standard padlock or TSA approved locks. FAA and parcel post approved without additional charges or packaging. 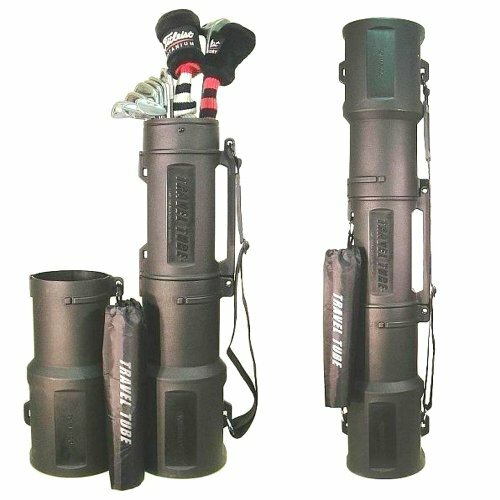 The Travel Tube can be used both as a shipping container and travel case for golf clubs, firearms, fishing equipment, baseball, art, or any other item which lends itself to the size and shape of tube. Designed for equal weight distribution of the items the tube is easy and safe to carry and can be attached to a motorcycle, ATV, or the exterior of any other vehicle. The Travel Tube is made of high-density polyethylene plastic that provides rugged protection of its contents while O-Ring seals ensure water resistance under the most adverse weather conditions. Weighing less than 7 lbs, it is substantially lighter than a traditional golf shipping container- and a further design feature makes it simple to convert into a standard golf bag. The three components of the Travel Tube may be simply and rapidly dismantled in order to load equipment, for easy cleaning and convenient storage. Great for golf clubs, rifles, baseball equipment, lacrosse equipment, architectural drawings, camping gear, etc. If you have any questions about this product by THE TRAVEL TUBE, contact us by completing and submitting the form below. If you are looking for a specif part number, please include it with your message.